Northern Tablelands MP Adam Marshall inspecting progress on the sealing of Carrigan Road (Main Road 507) between Boomi and Mungindi. 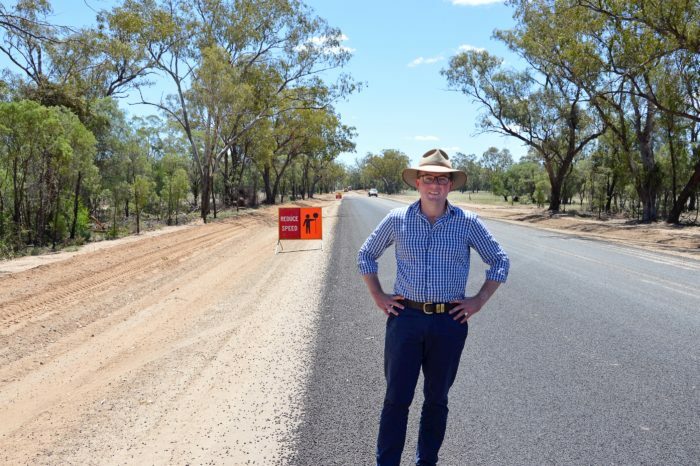 NORTHERN Tablelands MP Adam Marshall has inspected work on the $3.5 million project to bitumen seal the first section of the 58 kilometres freight route Carrigan Road, from Mungindi to Boomi, in the north west of the Moree Plains Shire. Mr Marshall congratulated Moree Plains Shire Council work crews for setting a cracking pace on the project, with the original 10 kilometres expected to be sealed so far under time and under budget. “With progress being made quicker than expected and at a lower cost, council now expects to seal up to 14 kilometres with the funding,” Mr Marshall said. Mr Marshall said more than $30 million of agricultural produce, on average, was transported off properties along Carrigan Road and out to market each year. “I’m thrilled this project is coming in under budget and well ahead of schedule,” Mr Marshall said. “It is absolutely critical to the productivity of Moree and the Boomi and Mungindi areas. “Local farmers and Moree Plains Shire Council have been pushing for the sealing of this road for close to 25 years. “This is great news and with 2.5 kilometres completed already and a further 1.5 kilometres expected to be finished before Christmas, it’s happening faster than was expected. “This route isn’t just an outback track, it is vital to the tens of thousands of freight movements each year and if the further three stages are locked in this will ensure the road isn’t knocked out when it rains. “One business alone on this road can account for almost 2,000 truck movements annually. Another lost count at 500, so this road is crucial and seeing it sealed has been a goal of both mine and Moree Plains Shire Council. Mr Marshall said sealing the road would guarantee all-weather access for farmers, school buses and emergency services. It will also save millions of dollars each year in transport costs for producers. The initial $3.5 million funding was included in this year’s 2018-19 NSW Budget, with Mr Marshall busily working to secure the remaining funds to complete the entire length of the road. Moree Plains Shire Mayor Katrina Humphries also praised the staff working on the project and thanked Mr Marshall for his advocacy thus far. “Council and the local community are so very pleased to see this major improvement to the road network,” Cr Humphries said.